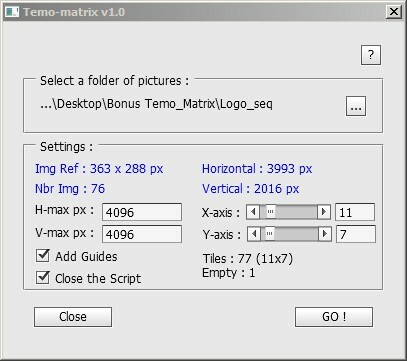 Creates a single image consisting of many tiles and equally sized set up in a matrix for the Viz Artist plug-in "Temo". Note : Created for the Viz Artist plug-in "Temo", but you can also use it to create matrix for any other use. For more details see the Instructions document provide in the downloads. The Temo plugin gives the user the possibility to create an image animation sequence, using a method much like the one used for making a cartoon film. The basic input for the plug-in is a single image consisting of many tiled and equally sized squares set up in a matrix. Each square of the image is made up to be a snapshot of an animation sequence, just like each picture frame is on a normal film. The image must be made up in advance with the aid of a image editing tool. In the property editor you tell the Temo plug-in how many tiled squares there are in the X- and the Y-axis. The plug-in is then able to show the tiles of the image one by one. By animating this, a "film like" sequence is created. The plug-in has only a small influence on the rendering performance. Included Files: a complete example with After Effects, Photoshop and Illustrator projects. Instructions. Note: Requires Adobe Photoshop CS3 or higher. Runs on Mac and PC in the same way, tested on CS5, CS5.5, CS6.